Designing Solutions. Building Trust. Enriching Lives. Following the tragic school shootings in Newtown, Connecticut, Virginia Governor Robert McDonnell appointed the Task Force on School and Campus Safety. The charge to the task force included the formation of recommendations addressing the safety and security needs faced by Virginia’s public schools. The Task Force convened a Public Safety Work Group and from that effort a School Design Sub-Group was constituted. The School Design Sub-Group was comprised of leading state officials who have the responsibility for the creation and implementation of various design codes, local and state law enforcement officials, higher education representatives, K-12 representatives, and private sector school design professionals. The group was co-chaired by Henrico County VA Police Chief Douglas A. Middleton and Moseley Architects President Stewart D. Roberson. Moseley Architects was also represented on the group by Douglas A. Westmoreland, AIA, a leading school architect in Virginia. Moseley Architects is honored to participate in this very important process and is committed to continuing to provide leadership to promote safety and security needs in all of its facility designs. 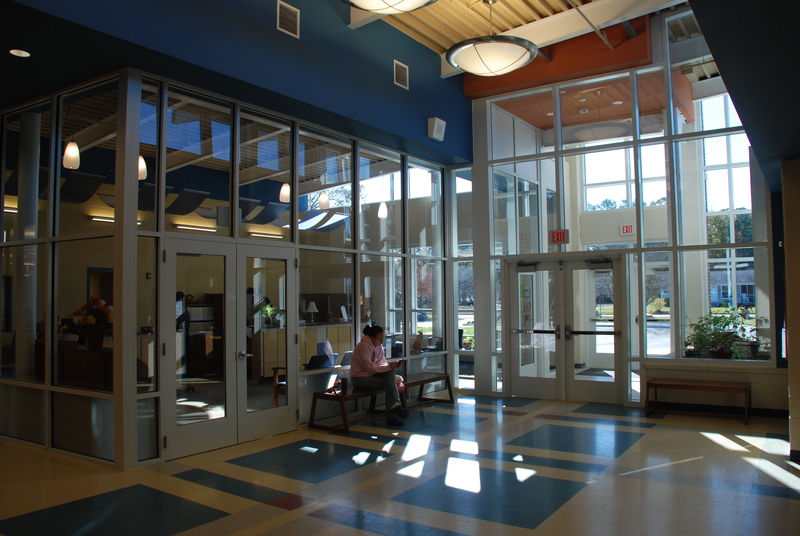 This renovation of Abingdon Elementary School in Gloucester, Virginia includes a new security vestibule, which directs visitors through the front office of the school to check-in. The expansive glass around the reception area provides excellent visibility of the activity at the main entrance. As communities across our nation seek to understand the tragedies that have struck schools, the safety of our school children remains an ongoing concern for anyone responsible for providing responsive facilities, especially educators and school designers. These concerns have changed the way we think about school safety when planning a new building or conducting reviews of existing facilities. Moseley Architects wants to share with you a summary of issues related to school safety that should be discussed with your design professional. It is important to recognize that investing the time and energy into a proper security training program for school staff and volunteers must be a top priority. This article focuses only on the physical, built-environment portion of a safety strategy. It does not address the school policies, procedures, or programs, which are a crucial part of a safe school strategy. As school facilities designers, we recognize that those discussions occur in local communities across America. The ability to create layers of protection is an important concept when thinking about school safety . No single measure is going to be a panacea. An intruder on a school site should be required to pass through several layers of security measures before coming into contact with school children. Security measures generally fall into two categories: passive and active. Passive safety measures are the coordinated design decisions that improve the safety of the building without changing the operation of the building or requiring additional staff resources. Active safety measures incorporate both physical design strategies as well as technology components to support the safety of the school. What is the Future of K12 School Design?